Flume is a sculptural intervention into the connecting doorways of gallery two, providing an provocative and intimate moment of transition and a tactile connection to the fabric of the building, where the qualities of thresholding are translated into a responsive and affectual environment. 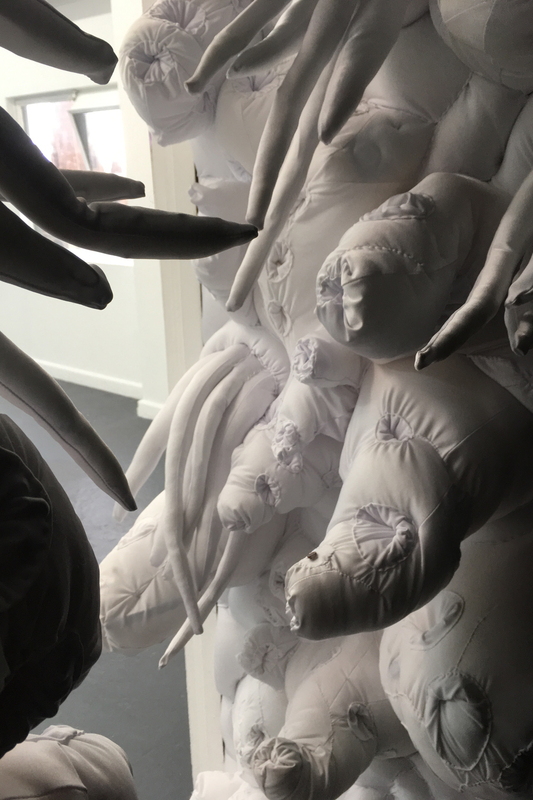 IMAGES | Andrew Goodman, Flume, detail of work in progress, 2016 | Images courtesy of the artist. Black-cube/black box: gallery space that withdraws and technological artwork that obscures its operative relations. Focusing on the luminance of screen and image, most interactive, software-based, and responsive art architecturally and proprioceptively withdraws into a dark void. Evacuating surprise, hilarity, oddity and vagueness, this retreat into the blackened space of screen time, stamps out the fissures that enable art to generate novel spacetimes. Such work and its spaces more often than not instill only ‘the feeling of’ interaction. What if a different kind of ‘soft’ art crawled the walls, doors and corridors of gallery spaces instead? Intensive transfers of data, pulsing horizontally and vertically in passageways; algorithmic moods whispering operations to each other; the tonalities of light, sound, touch computationally and corporeally differentiating. You have entered Flume. Or, has it entered you? In this pliant, alien landscape where tentacles multiply across a threshold or where an enigmatic glowing room entices without reason, there is no ‘you’ – the predetermined participant armed with an imperative to engage – anymore. Rather, an inorganic vitality pulses through bodies and software in waves and particles, sweeping matter up in to pulsing, soft ‘feelings’. and it feels them as being spatially and temporally distinct from itself’ (Shaviro, 2012: 60). The passageways of Flume channel and gather these feeling, grasping entities, making felt the compositional modes through which data might become affective. Such modes cannot be immediately perceived by (human) bodies, for we inhabit and generate different occasions of experience. The problem with much contemporary software-based art is that it resorts to forms of presentation – such as visualization and sonification – that attempt to translate ‘data’ for our presentational experience. Instead, Flume enables an ingression of data into the space of art. It enables an experience of ‘soft’ feelings that cannot be recognised by us and yet are nonetheless felt. 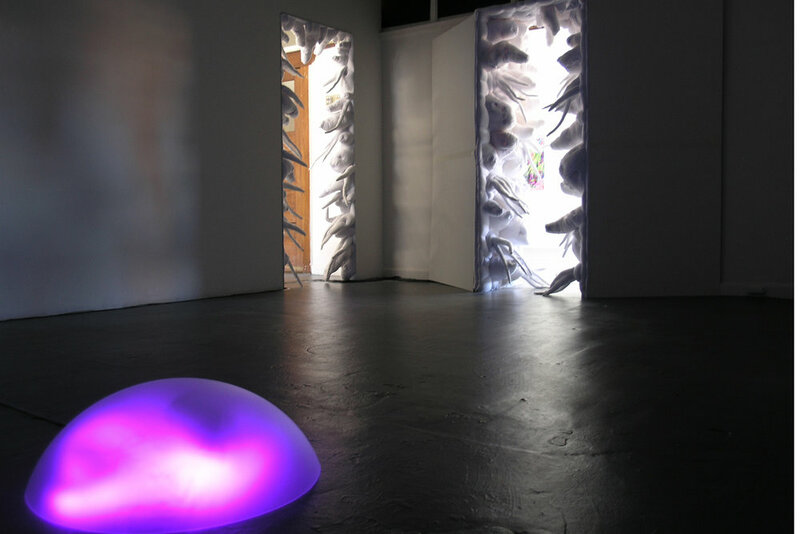 At other times, bodies – yours, mine, the air – become Flume’s sensors and transducers, tuning the soft sculpture’s rhythms, fielding the movement of soft feelings around the space, enabling the tonality of light to adjust between bright whiteness and hushed twilight, attenuating the scatters of the auditory topology. It’s not that there’s no space for (human) corporeal experience here. It’s that ‘the body’ fails to form as distinct entity, its spacetimes merging and differentiating instead with soft durations. intensities pull away and toward each vibratory field. An ecology of human and more-than human rhythms emerges, redistributing affects through passageways – movements of bodies, air, data dispersing throughout the space. In the process philosophy of Alfred North Whitehead and William James – returning now to a world that has effectively black-boxed most of its processes – all experience is already throbbing with feeling: ‘The experience starts as that smelly feeling, and is developed by mentality into the feeling of that smell’ (Whitehead, 1933: 246). A ‘smelly feeling’ is neither possessed by us nor directly attributable to some odorous object. It is, instead, a smell’s diffusion and tonalities, its timbre; pungency still shaded by all its redolent relations to old smells lingering, new smells pressing for air. All feelings begin ‘smelly’ – begin already in process. Perhaps none more so than ‘soft’ feelings, since data, quite literally, processes incessantly. But the smell and tonality of soft feelings run the risk of being boxed away and re-packaged as ‘the feeling of’.... Flume, instead, enables something beautifully ‘elsewhere’ to emerge: a ‘feeling of’ processing in process, shaded still by moods, flushes, and potentials. Anna Munster is an associate professor in Art and Design, University of New South Wales. She is the author of An Aesthesia of Networks (2013) and Materializing New Media (2006).